Many publications have shown that eating whole grain reduces the likelihood of diabetes, coronary heart disease, and hypertension. A recent article (1) analyzed 11 prospective studies about how whole-grain food prevents these diseases. It points to bran, and specifically a particular component of bran, as the most important preventive component of whole grain. In analyzing the studies, the authors determine that 40 gm of whole grain a day reduces these diseases. 40 gm per day (one bowl of cereal) of whole-grain reduces the incidence of hypertension about 20% and of diabetes about 50%. They then analyze the components of whole grain to find what aspect of whole grain is responsible for whole grain's beneficial effects. The FDA has defined a whole grain product as a product with at least 50% whole grain, and whole grain as having all three elements (bran, germ and endosperm) in the same proportions as an intact grain. It differs from an unbroken grain. Polished rice can be considered unbroken, but it does not have bran and germ. The bran and germ are responsible for the beneficial effects of whole grain. Studies of refined grain (without bran and germ) have not shown the same reduction in diabetes, coronary heart disease and hypertension that whole grain has. The authors feel that because whole grain has much more bran than germ, bran would contribute more to the beneficial effects of whole grain than the germ component would. They also cite several studies that determined that the beneficial effects of whole grain came from bran. They then try to determine what it is about bran that confers the benefits. Fiber is the most often mentioned component in the medical literature. Other components the authors examined were vitamins, minerals, polyphenols, and the antioxidant ferulic acid (one of the polyphenols). The authors question today's emphasis on indigestible fiber as the beneficial component of whole grain. Because Burkitt emphasized fiber in his classic study, indigestible fiber has been the subject of many of the studies about improved health from whole grain. There are three separate benefits that can be attributed to fiber. The first is the stool bulking effect that speeds transit of the stool through the gut. The second is the formation of gels, which slows carbohydrate absorption. The third possible benefit is the formation of absorbable healthy fatty acids from fermentation of the fiber. The authors place a greater emphasis on the nutritive aspects of bran. They find that the greatest concentration of these nutrients is in the aleurone. Aleurone is a major component of bran and is generally overlooked. It remains attached to bran during processing of whole grain. 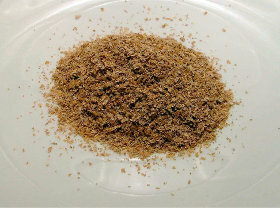 During processing, the production of bran results in approximately 50% live aleurone cells. The remainder of bran is pericarp – the indigestible fiber. It is resistant to digestion and provides bulk to speed passage of stool. It resists our digestive enzymes and the enzymes secreted by bacteria in our gut. The main advantage it may provide is preventing prolonged exposure to possibly adverse toxic products that could affect us. The bran aleurone, on the other hand, is nutrient rich with vitamins, minerals, and polyphenols (especially ferulic acid). Comparing whole wheat flour to wheat flour, for example, shows an 80 to 90% drop in thiamine, niacin and vitamin B6, and a 50 to 80% drop in minerals. And bran has over 90% of the polyphenols in whole grains, while germ has only 1%. It also has 4 to 11 times as much vitamins and minerals as germ. These minerals are found in the aleurone cells. The publication has some excellent photomicrographs showing the fluorescence from the minerals in the aleurone cells. The minerals are chemically bound to phytates in the cells. Some other publications have raised concerns about the phytates in whole grain, as well as in legumes. Animal studies showed that consuming them led to a smaller proportion of minerals being absorbed. However, because food containing phytates has so much more mineral content, the actual amount of minerals absorbed is greater, even though the proportion is less. Thus bran is a great source of minerals. The study emphasizes the role of magnesium in preventing hypertension and cardiovascular disease. It does not discuss the role of potassium, even though it admits that potassium is more abundant inside cells. The importance of magnesium in cardiovascular health is highly supported in the medical literature. But potassium and the potassium sodium ratio have even more extensive literature supporting their importance in preventing hypertension and cardiovascular disease. They point out how a host of enzymes are involved inside the cell to combat ROS (reactive oxygen species). Ferulic acid has been shown to activate some key antioxidant proteins. Thus they feel that the main antioxidant value in food is provided by stimulating the cells' natural antioxidant mechanisms. And ferulic acid has been shown to do this. 1. Whole grains, type 2 diabetes, coronary heart disease, and hypertension: links to the aleurone preferred over indigestible fiber. Lillioja S, Neal AL, Tapsell L, Jacobs DR Jr. Biofactors. 2013 May-Jun;39(3):242-58. doi: 10.1002/biof.1077. Epub 2013 Jan 28.